You know that little voice in the back of your mind that pushes you to do something even though you have no idea what the outcome of that will be? That is how I ended up going to this event. I’d heard about this event a week prior, but didn’t actually push myself to go until the last minute. I mean the tickets were free and female tech events are a rare species near my neck of the woods so I figured why not? And that, ladies and gentlemen is how I spent my Friday night networking instead of sitting in my room watching Youtube videos. (I don’t get out much). This was actually the first tech event for black women that I’d ever attended and my second tech event overall, so I didn’t know what to expect. While deciding to attend was an impromptu decision, it was one I’m glad I made. What is Black Tech Women INDY? Like the name implies, this organization’s goal is to bring together black women of all ages in the tech community to inspire and support each other. They have a Facebook group along with other popular social media platforms. The Indianapolis branch of this organization is lead by Kelli Jones who is an awesome person to talk to and get advice from. The event itself centered around the main activity of making vision boards. This event took place in mid-January so it was a very timely project. 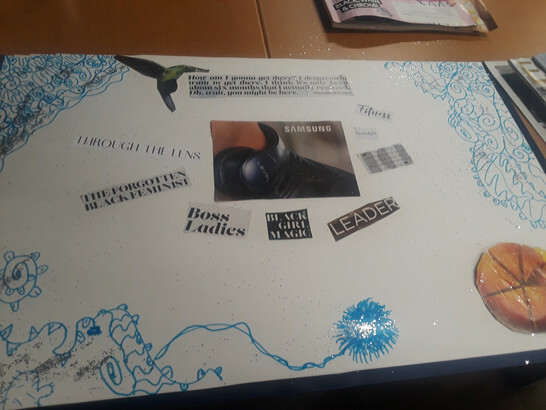 Vision boards are a visual way for you to map out your goals for the year using pictures and for a visual learner like myself, pictures are very important. My vision board is pictured below. I kind of went philosophical with this project without even meaning to. The center of the board represents my goals for the year, pretty obvious. The scribbles along the corners surrounding it are a different story. They represent the negative influences in life and distractions that will try to take me away from my goals. I tend to scribble when distracted so the concept behind this board is actually something I can apply to my life( and I have been). Overall, this was an event that I would definitely go to again. It wasn’t as structured as other events, however that’s what made it unique. It wasn’t intimidating like meeting with employees and owners of big companies usually are. It was much more casual actually. And while I was the youngest person there, it did teach me how to conduct myself in an adult situation and have real conversations with potential employers. I give this event five out of five glitter covered vision board. (There was lots of glitter).